It's that time again! This time I had no idea what book I was going to write about. Nothing was coming to mind. My son and I have been reading various review copies of books lately - nothing that could be considered a classic of any sort. I thought and pondered and suddenly from across the room I spied my blog salvation! I Am a Bunny . Walla! I Am a Bunny . How much more simple could it be? Originally published in 1963 (and holed up in my in-laws home since just about then, I'm sure!) this is the story about a bunny named Nicholas. It is often described as a "gentle" story and introduces children to the concept of the four seasons. The illustrations are different than what I am used to in most of Richard Scarry's other illustrated books which I find fascinating. The illustrations truly do make you feel more relaxed. I only recently met Nicholas having not before had the pleasure of knowing him. I don't recall reading this book when I was younger but a copy of this book belonged to my husband's family. In a recent purging ritual involving their school closet, this book was unearthed and handed over to us to read to our young two year old. The timing couldn't have been more perfect as he has noticed the weather changing with the season this year and I wasn't quite sure how to introduce the concept of seasons. Nicholas is a handy little tool in that respect and cute to boot! Not sure how I missed him before but glad to know him now! Although this book was published in 1963 (our family copy is a 1963 edition!) 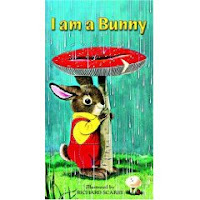 you can find a brand new copy of I Am a Bunny on Amazon. The book appears to have been popular for decades and there is still some easy access to it. I love that some of the older classics are still around and in print. Somehow I find that soothing. We've been enjoying lots of older books thanks to Before Five in a Row. We read Ask Mr. Bear today. I Am a Bunny looks like a good, reliable read! It does look good. Very few books deal with the seasons-that's very cool. Ohmygosh, my brother Daniel loved that book so much when he was a wee lad. He had the dang thing memorized and for a while his imaginary friend was named Nick. Even though he's a big strapping week-shy-of-18, he has his copy on a bookshelf in his room and it is one of his treasures. He even gave it as a gift to one of our cousins' new baby boy and was all sentimental! I can't imagine raising my own kids without this book!! I love this book - the illustrations are just beautiful! I wouldn't have recognized it as Richard Scarry if you hadn't pointed that out. Very different from his books of today. I'll be on the look out for it! I loved Richard Scarry books as a child, but I never read this one. Thanks for the recommendation! Richard Scarrey. I feel like I've heard that name before. I'd completely forgotten about this book. We had a copy when our children were little (in the '70s). It just disintegrated from so much use. Thanks for sharing. Never heard of it, but since my grandmother taught 4th grade, I have several "vintage" copies of classics, such as Mike Mulligan, Horton Hatches an Egg, etc. It's SO cool. And I remember reading books at my other grandmother's house that were my dad's or aunt's -- Cherry Ames, The Bobbsey Twins etc. So fun to think about a book's history. I picked up this book at a garage sale when my children were young. It was one of the most popular books for me to read to them for a time. Another hugely popular book for my son was Richard Scarry's book of trains, cars, planes, etc. He would study that book on his own for hours. We love this book! My nearly 2 year old saw the picture ans started saying, "Bunny! Bunny! Read!" The pictures are so rich and vibrant and fill of colors, and lend themselves to interaction. LOL! Just now as I was typing- my little one blew, just like we do everytime we get to the dandelion page!